3.1 To provide a forum for discussion of issues that specifically affect academic faculty members of AASUA. Academic faculty members are all those employed at the University of Alberta under the Faculty Agreement. 3.2 To formulate recommendations regarding these issues to be brought to AASUA Council. 3.3 To build a collegial community of academic faculty members. 3.4 To work constructively within AASUA to advance the common interests of all AASUA members. 3.5 To promote teaching, research, and public service as the core functions of the University of Alberta. 3.6 To promote and defend academic freedom. The meeting has been called by the acting chair of AFC, Professor Colleen Cassady St. Clair of Biological Sciences, to give faculty an opportunity to discuss the compensation and negotiations proposals that are proceeding to the AASUA membership for a ratification vote. Every member received electronic copies of these proposals from Roxanne Rowe (on behalf of AASUA President Ian MacLaren) on May 11. Further discussion of them can be found on Rhumblines and Whither U of A. You have hopefully by this time also received a report on the Council meeting of 15 May 2012 from your departmental representative. At that meeting, Council voted 24 to 6 to recommend the proposals to the membership for a ratification vote. Five of the six votes against the proposal were from faculty members. The proposals before us, the product of an extraordinary process outside usual negotiations, offer the AASUA membership a below the cost-of-living increase for two years (2013-2014 and 2014-2015). This offer is joined, inseparably, to another proposal that creates a “Renaissance Committee” charged with “respond[ing]” to the “pressures” of “academic compensation” at the University. The “Renaissance Committee” will also — if the membership votes to ratify these proposals — be charged with introducing teaching-only tenure-track positions. As the proposals have ramifications for the core functions of the University, academic freedom, and the faculty’s place and role in the institution, all faculty are urged to attend. And please pass on the word about this meeting. As you probably already know, all of these negotiations have been occurring in great haste, precipitated initially by a request from the Provost for an extension of the current contract before his departure for a year’s leave on 1 July 2012. It is very much hoped that the haste with which this special AFC meeting has had to be called will not keep anyone from attending. The importance of the vote is great, as members are not voting simply to ratify a two-year ATB increase at a rate of 1.65%. Members will be choosing whether to authorize a single committee to plan the restructuring of the professoriate at the University of Alberta with a mandate that treats “academic compensation” as the problem while leaving expenditures on the Administrative side of the University unchallenged. 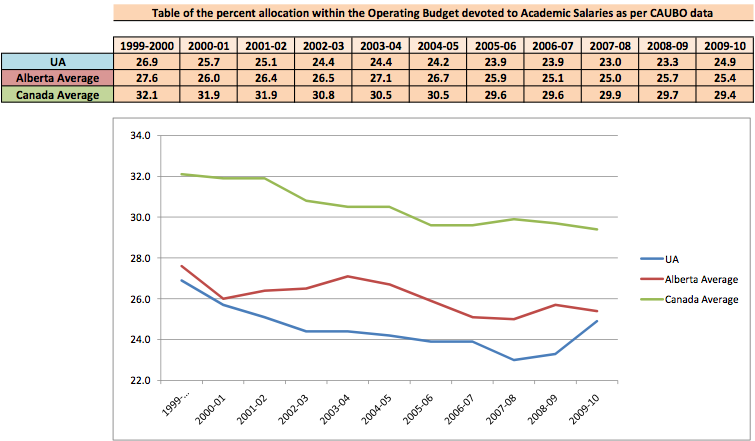 As a Maclean’s article from 2010 noted, “Administration costs at the University of Alberta have doubled since 2000-01 and have quadrupled since 1994-95.”* And, as this chart indicates, the University of Alberta’s expenditures on academic salaries lag well behind the national average. The Biological Sciences Building (BSB) is the castle-like building immediately north of the Centennial Centre for Interdisciplinary Science (CCIS), between Earth & Atmospheric Sciences (EAS) and the Faculty Club. CW is the centre wing which can be accessed from any door on the building (there are at least 6). Follow the signs to CW and go up one floor from ground level to the third floor. CW313 is halfway along the hall on the south side; you’ve not gone far enough if you find yourself in the student mail room and too far if you find yourself in the anatomy lab (MUCH too far). Coffee and child care will be provided, but if you need the latter, please let Professor St. Clair know [cstclair@ualberta.ca]. It is hoped that Arts Faculty will also be able to attend the Town Hall that will follow at noon in the Edmonton Clinic Health Academy ECHA (the new ‘Lego’ look-alike bldg on the sw corner of 114 Street and 87 Avenue). The Town Hall will be held in L1 490. * See the article by Erin Millar at http://oncampus.macleans.ca/education/2010/04/01/the-high-cost-of-status/. This entry was posted in University of Alberta Compensation Negotiations 2012 and tagged AASUA Compensation Negotiations 2012, university of alberta. Bookmark the permalink.